Lately, I’ve noticed that my browser doesn’t seem to be rendering the standard FCC font. I opened up the console and saw a lot of errors regarding font loading. 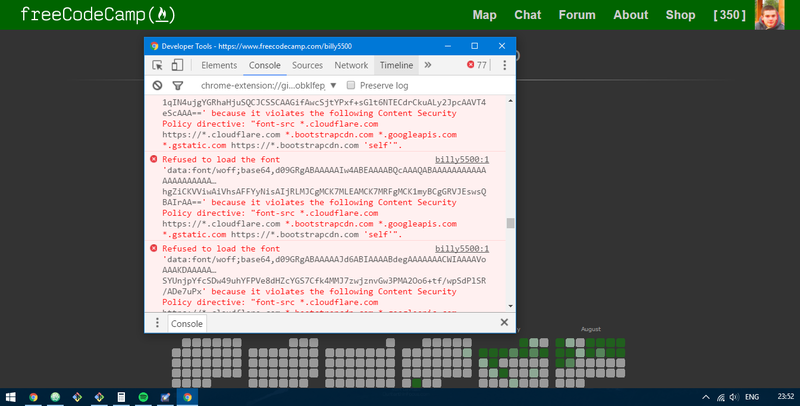 Refused to load the font '…' because it violates the following Content Security Policy directive: "font-src *.cloudflare.com https://*.cloudflare.com *.bootstrapcdn.com *.googleapis.com *.gstatic.com https://*.bootstrapcdn.com 'self'". I get this error on Chrome 52.0.2743.116. Maybe it has to do something with my extensions? The font loads properly on all other browsers and when running Chrome in Incognito mode. Just thought I’d share this issue here, didn’t want to go straight to the Github repo.